CECIL RHODES Autograph Letter Signed. Cecil John Rhodes. British merchant venturer, mining magnate and South African politician. Prime Minister of Cape Colony (1890-1896). The state of Rhodesia was names after him (now Zimbabwe). ALS. 1p. Groote Schuur, Rondebosch, Cape Town. Not dated. 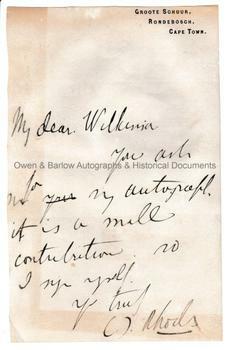 To "My dear Wilkinson". "You ask me for my autograph. It is a small contribution, so I sign myself, yrs truly, C.J. Rhodes". 19 x 12 cms (7.5 x 4.75 inches). Slightly trimmed. Some browning and offsetting and with mounting traces to verso. Generally good. The addressee is possibly Spencer Wilkinson the journalist and military writer.